To see the aftermath of a flood of biblical proportions, visit the southeast part of Washington State. Here, 15,000–18,000 years ago, Ice Age waters of unimaginable volume and destructive force roared through, scoured, and shaped vast expanses of the landscape. 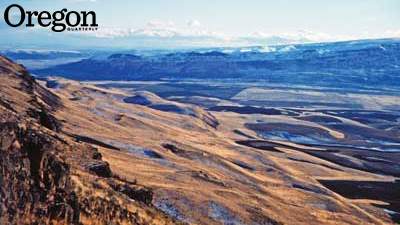 In Washington’s Channeled Scablands Guide (Mountaineers Books, 2012), John Soennichsen ’74 describes the area and, in the excerpt below, reflects on the quality of its silence. In the Drumheller Channels, perhaps more so than at any other place I have visited in the Channeled Scablands, there exists a silence and sense of isolation I don’t think I have experienced anywhere other than the saline floor of Death Valley. People may think they know what silence “sounds” like, but I’m convinced the majority have experienced these silent episodes in populated areas, where the quiet can be judged only in juxtaposition to the normal urban sounds that prevail. The silence of a city street at night, the quiet of an empty office building when you are the only worker still at your desk, the solitude of an empty sports stadium when you are the sole spectator sitting in the stands . . . these are the sorts of experiences people cite when you ask them to describe the quietest place they have ever been. But just as the darkness of a bedroom with the lights turned off can never compare to the blackness of a cave with your lantern switched off, so is urban silence less pure, less absolute than the silence of natural settings. If we listen hard enough, even in the most noiseless of urban settings, there will always be the murmurs of man all about us—the humming and whirring and buzzing of noises we don’t even realize are constantly in our ears until we withdraw from that urban setting and experience a truly natural environment far from the influence of man. Out in these places away from the domain of the human race, far from the machines, the music, from television and traffic and talk, you can slowly begin to understand what the true silence of the natural world is all about. This is the time when the sounds associated with civilization will slowly fade farther and farther away. But it is this same isolation from civilization, from contact with other humans, that allows for a contact to be made with nature and oneself. More to the point, it is that isolation and silence that allow a person to make contact with the dimension of time, the ruler of this and all other landscapes formed by geologic events occurring over numberless millennia. In this natural world of silence, a person is best able to begin imagining the sounds that must have accompanied the natural forces that created this place. It is a silence that also allows you to imagine what people who may have lived here 15,000 years ago—and there is a very good possibility that people were here—might have heard and felt and seen through terrified eyes as a series of great, brown, thundering waves of slurry flowed across a formerly green and rolling landscape, first tearing at the soil, then snatching at the basalt columns beneath, peeling them off the cliff faces like some hungry grizzly peeling bark from a yellow pine. At first, there would have been that same silence a visitor to this place experiences today. Then, even before the water arrived—perhaps as much as a half hour before—there would have been a thunderous noise, a strong wind, perhaps even the sense that there was the mist of some unseen moisture source in the air. Then the ground would have begun to shake and the hunters and gatherers experiencing all this might have received their first sensations that something quite ominous was about to occur. The sounds of silence in this great geological landmark enhance the already powerful sensation it gives off as being a wilderness area worthy of both respect and caution.